All of the empirical analysis at ScotusOA.com is based on the SCOTUS transcripts. We constructed a dataset drawn from the text of every Supreme Court oral argument from 1955 to 2017, based on 1.7 million speech events by justices and advocates. All of this came from Oyez.com. The Supreme Court makes some of these transcripts available but not all—only 15 Terms of the six decades that Oyez provides—and many are not fully identified as to who the speaker is. Oyez developed a program to identify the speaker, went back through the transcripts to 1955, and continues to improve the quality of the transcripts, checking for accuracy. How all of that data became available is an interesting story. The history of the development of this invaluable resource is an interesting tale of the somewhat obsessive focus one person, Jerry Goldman, on what many thought was a very obtuse idea for a long time, but is now recognized as a great legal resource. It is also the story of the sometimes-odd interaction between the very staid institution of the Supreme Court and quickly changing technology. The Internet was yet to be, so Jerry set up the cards using HyperCard, a software tool that stacked and interconnected digital cards, with text, images, and other simple concepts. The Hitchhiker’s SC Guide used bitmapped, black-and-white images of the justices and gave information on the cases and the Supreme Court building. In the early 1990s, Jerry made came to an agreement with the National Archives that allowed him to use their audio recordings of Supreme Court oral arguments, so as long as they would not be used commercially. In 1994, with the help of Joe Germuska, self-designated “Chief Nerd” of Northwestern’s Knight Lab, Jerry created a small prototype of a digital audio workstation that would eventually allow him to make the Supreme Court audio accessible. He received a small grant from NUL, and a subsequent NSF grant in 1995-1996, to build the equipment, and “OYEZ, OYEZ, OYEZ” was created. Another grant in 1996 from the NEH’s Teaching with Technology program allowed Jerry to slowly add more cases, using simple technology that involved cutting and pasting when updating changes to materials. Although the site only had about 100 select cases—all significant constitutional law cases—the server was struggling with the unwieldy technology, so Jerry and Joe decided to create a database of case records and justice records, with the audio on a designated audio server. In 1996, at the same time that Jerry was developing what became Oyez.com, another resource, “May it Please the Court” launched, in which 23 edited versions of the oral arguments, with commentary, were made available for purchase on cassettes. That project gained enormous media attention because the Supreme Court threatened to sue the developer for using the case audio contrary to the arrangement with the National Archives. Ultimately, the Supreme Court gave in and actually changed its policy, permitting broader use of the recordings. 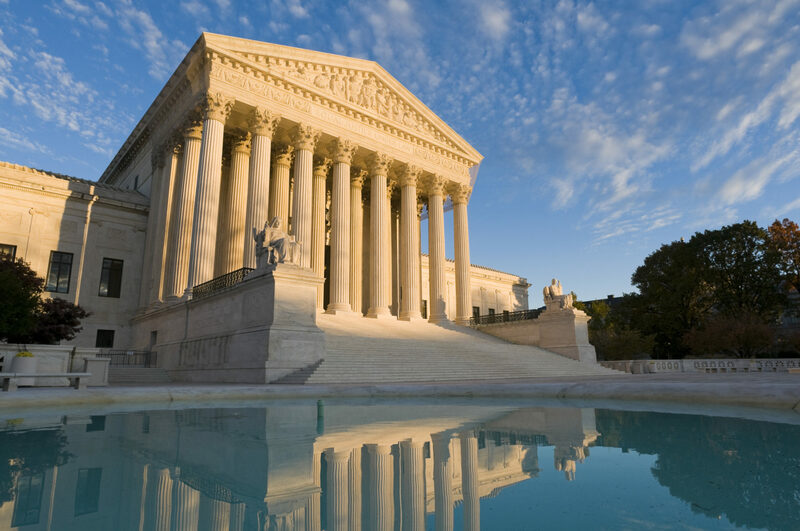 The controversy sparked the media’s interest in using audio recordings of oral argument as part of their general news coverage, and that is when the use of Supreme Court oral argument audio really took off. That appetite for Supreme Court audio hit another high in 2000, in response to Bush v. Gore. The prospect of the Supreme Court deciding a presidential election led to a sudden and enormous demand for a live feed of the two cases (Bush v. Palm Beach County Canvassing Board and Bush v. Gore). Knowing that the Court would be very resistant to a live video or audio feed, Jerry wrote to Chief Justice Rehnquist on November 25 to try to convince him to release the audio the same day as the argument, as a substitute for a live feed. As seen in the fax reproduced below, Rehnquist wrote back, agreeing to release the recordings in these exceptional cases on the same day as the argument. The remaining cases, orders etc. still had to wait until the end of Term for release to the National Archives. Eventually, the Court adopted the end of the week release of all audio, with occasional same-day release for other highly salient arguments, such as the Obamacare arguments and some of the gay marriage cases. Gradually, with some assistance, Jerry went backwards through the cases, collecting earlier arguments. Leveraging various grants, and collaborating with several scholars, by 2003, the collection extended back to 1980, and by 2014, the Oyez collection was made comprehensive back to October 1955. Today, Oyez also includes not only oral arguments but opinion announcements and speaker-identified transcripts. Jerry says: “The metadata for every case—including our abstracts—remains a work in progress but every case that is in Spaeth is represented in Oyez plus a substantial number of pre-Spaeth (i.e., pre-1953) cases.” Along the way, SCOTUS phased out its reel to reel recordings and went digital in 2004, and Jerry had created a standardized process for making the data available quickly. Since 2010, Jerry reports that website traffic has increased at approximately 10% to 15% per year. Traffic has been growing particularly strongly in the last two years, going from 3.3 million users (in 6.9 million sessions) in the November 2011 to November 2012 period, to 7.2 million users (in 14.2 million sessions) over the same period in 2017-2018. That is a lot of people who owe a debt to Jerry for pursuing his vision with such determination. Jerry defied traditional academic incentives and has made a lasting contribution as a result. Jerry was advised by colleagues not to build a resource that he would get little credit for and would take away time from his research. Fortunately for those of us who enjoy not only empirical analysis such as that done at ScotusOA, but those who value timely analysis of the arguments on ScotusBlog and other forums, Jerry was stubborn enough to continue. The history of Oyez.com shows how technological change can bring about institutional change. The Supreme Court has resisted the call for television access for decades, and it is clearly going to continue to do so. But the development of the Internet created the demand for a different type of access, one that was harder to resist. Once it became clear through Jerry’s efforts that online access to Supreme Court transcripts and audio was possible, a new constituency developed around the demand for such access. The Court’s reasons for rejecting televisions in the courtroom did not seem to apply to this new medium. The Court had to either develop new reasons for why it would not make transcripts and audio available, or else had to concede the point. In the end, the Chief chose transparency, but the Court may not have anticipated all of the implications of that move. In particular, it probably never occurred to the members of the Court that some day social scientists would be using text data mining to place their conduct at oral argument under the microscope. The justices may not relish empirical findings such as that they favor one side over another at oral argument or that some justices’ votes are highly predictable based on whom they interrupt. The justices may have also not appreciated that their behavior at oral argument was already becoming more performative (partly due to increasing political polarization) and that the increased transparency brought by Oyez might accelerate this trend. Lawyers, law students, journalists, and academics who study the courts all benefit from Jerry’s work in founding Oyez.com. It is hard to think of one person who has done more to make an aspect of the Supreme Court’s decision-making process more transparent, available, and accessible to the broader public. This post is based in part on a telephone interviewwith Jerry Goldman on November 13, 2018, and follow-up emails. Laughter at the Supreme Court—humor or advocacy? When is a cross not just a cross? Ginsburg is back: is she feistier than ever?